I want to start off today’s post by saying I’ve really been enjoying connecting with you all lately. 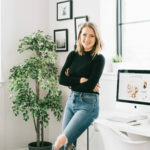 I have been trying to answer every post comment, Instagram tag, and email as soon as it comes through. And I’ve been finding that the more I do so, the more I feel connected to you guys. It’s like duh, right? But still, it’s something I’ve been feeling a lot recently, and I’m grateful for being able to have such awesome readers/followers/fans/FRIENDS. 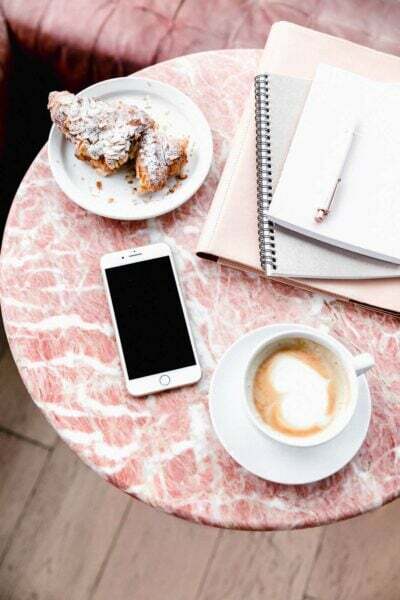 Because did you know a lot of bloggers have readers that leave comments saying how stupid the blogger is and how dumb they are and how the recipe failed so badly? But not my readers, no. You guys are so nice and kind and leave me comments that say things like “just made this with cannabis butter. oh wow.” (<-link for proof). So, you hilarious, awesome, kind people, (*wipes tear*) thanks for being you. And now I have cake. Cake cake cake cake cake. Spring is just around the corner, so to celebrate I made the most springy cake there is: hummingbird cake. What is hummingbird cake, you ask? 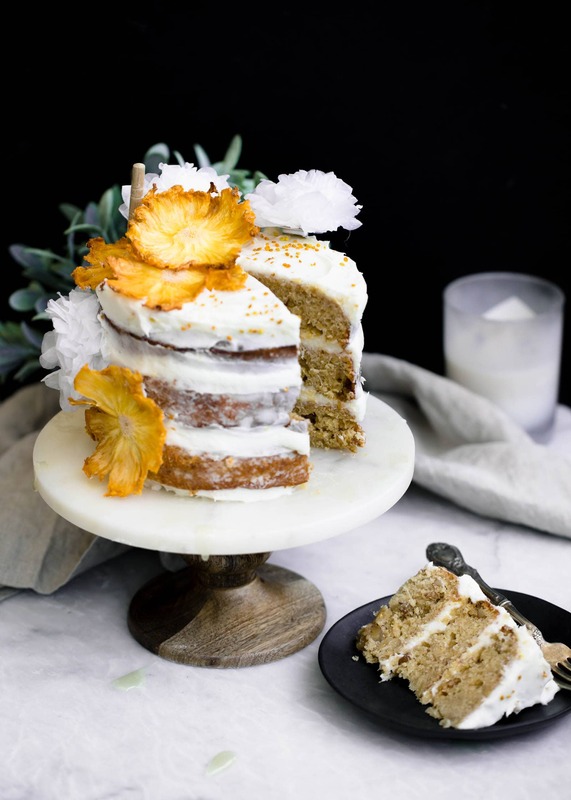 In essence, it’s a supremely moist cake that’s loaded with mashed banana, pureed pineapple, and some choice spices. This masterpiece is then topped with a thick cream cheese frosting and is usually devoured within mere minutes. This southern flavor combination of banana and pineapple is relatively low-key in the baking world. I honestly don’t know why, because it’s so delicious. Especially when you pair it with a cream cheese frosting with just a hint of lemon. Oh, and decorate it with bee pollen and dried pineapples that look like flowers. Or just like….spring. Kind of. Well, if you’re not living in the tundra that is the East Coast. Sorry, you guys. Once again I’ve used three 6-inch cake pans to make this hummingbird cake look extra special. But it will bake just as well in two 8-inch pans. The frosting amount will work for either variation. Peel a pineapple and use a sharp paring knife to remove those little brown buds that look like holes. Cut said pineapple into really thin slices. Place pineapple slices on a silicon baking sheet and place in oven for 2-3 hours, turning the pineapples over every 30 minutes so they dry out evenly. You end up with the prettiest dried pineapple that also doubles as fruit leather! I couldn’t stop a’snackin. Preheat oven to 350°F. Grease and line three 6-inch cake pans with parchment paper (alternatively, you can do two 8-inch pans). In a large bowl, combine banana, pineapple, brown sugar, vegetable oil, eggs, and vanilla extract. In a separate bowl combine flour, baking powder, baking soda, cinnamon, and salt. Fold the dry ingredients into the wet, mixing for at least 20 strokes to activate the gluten. Fold in the walnuts. Pour batter equally into prepared pans. Bake for 30 minutes, then allow to cool completely before frosting. 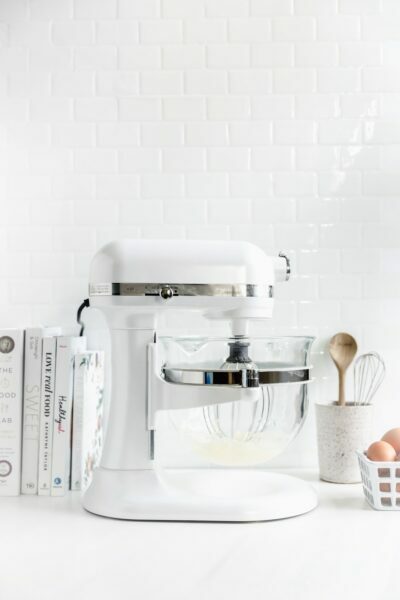 To make the frosting, beat the butter and cream cheese together using an electric mixer or a stand mixer with a paddle attachment. Add in confectioner’s sugar, milk, and lemon zest and beat for 30 seconds. 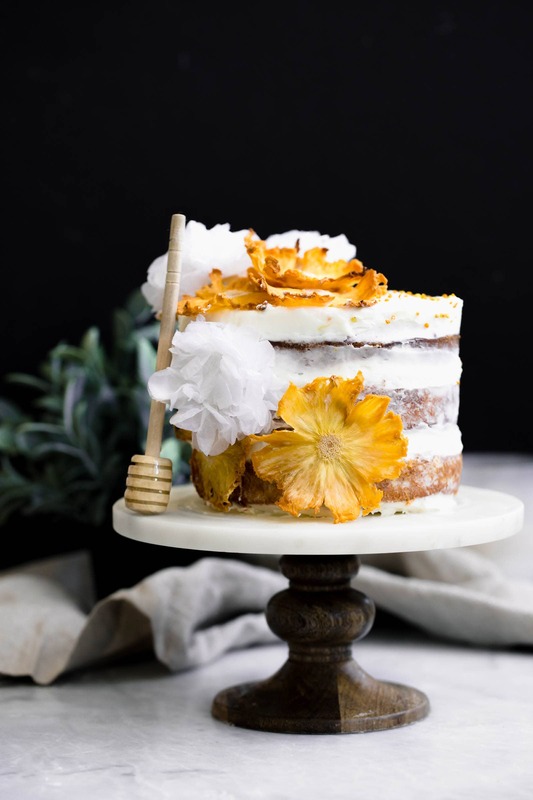 Frost and decorate with flowers, dried pineapple, and bee pollen! This cake looks SO good, and so springy, and I really needed it because we just had another snow storm here in Boston and I’m so over the sidewalks being coated in ice and brown snow (gross). I have to try this cake, so much YUM! Omg I know!! My family is all in Boston and I feel so bad for all you Bostonians! I notice that the sides are not covered in frosting. THAT MAKES A LOVELY, RUSTIC PICTURE BUT IS THERE ENOUGH FROSTING TO COVER THE SIDES IN THIS RECIPE? Hi Lisa! Yes, this recipe is what’s called a “naked cake.” Because it’s a pretty sweet cake, I don’t think you need the extra frosting on the side. There is still a good amount between the layers. BUT, if you want it to cover the sides, you should do 1.5x the frosting recipe! Thank you Karine! I love decorating cakes with natural elements! This looks so yummy! Going to try and make it this weekend. All your recipes are amazing and I hope you make a cookbook soon! Omg THANK YOU Neha! I’d love to do a cookbook one day. I’ll keep you posted! i love how these pineapple flowers look! the color is such a beautiful intense yellow, and i love the frilly edges. and it’s not spring break yet for me ? there’s finals to deal with first, but then freedom!! Good luck on finals! Rooting for ya! tHIS LOOKS AMAZING AND THE DRIED PINEAPPLE!!! CANT WAIT TO MAKE IT THIS WEEKEND! It’s such a slight but (in my opinion) necessary addition. Really brings out the tang in the cream cheese and cuts all the sugar from the frosting and cake. And omg I actually do! I just made this cake for my GF friend’s birthday. 1:1 ratio, everything else the same, and it was AMAZING! Such a gorgeous cake Sarah! It would be perfect for the Easter dessert table! Totally with you! I love Easter desserts! Woahhh! Those pineapple flowers are amazingggg! 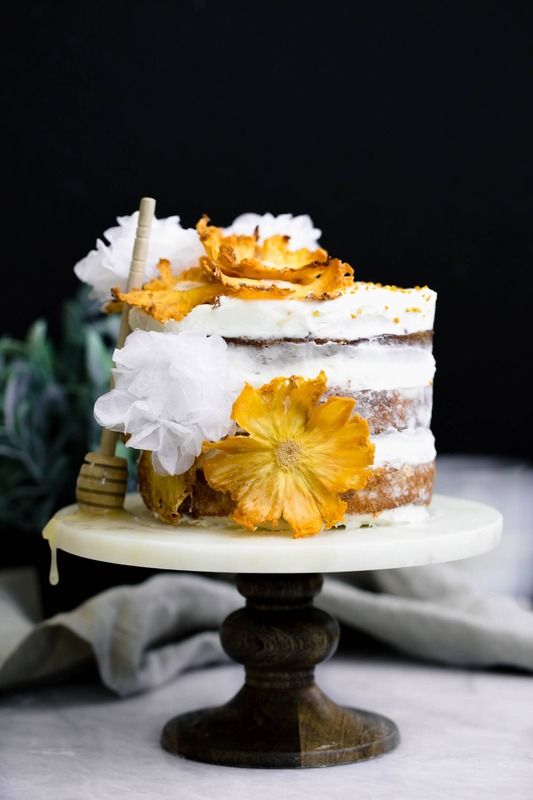 It’s barely 30 degrees here but I know a slice of this cake would give me so many spring vibes! Oh, and I love that you went light on the frosting so you can really appreciate the flavors in the cake. Thanks for sharing another beauty! Right? I love ‘naked’ cakes 🙂 Thanks Ashley! The pineapple puréed is from the can or you make the purée? Sarah, that cake looks incredible!! I made one years ago but I like your recipe better. i think it’s going to be on the “to make” list for me! And those pineapple flowers look great too- thank you for sharing this! Thank you so much Donna! With Easter coming up, it’s definitely an excuse to make this cake again! I could stare at this cake all day. So perfect for spring and Easter! This cake gives me hope that one day I’ll see our grass again underneath these THIRTY freakin’ inches of snow! Yay spring and delicious cakes! 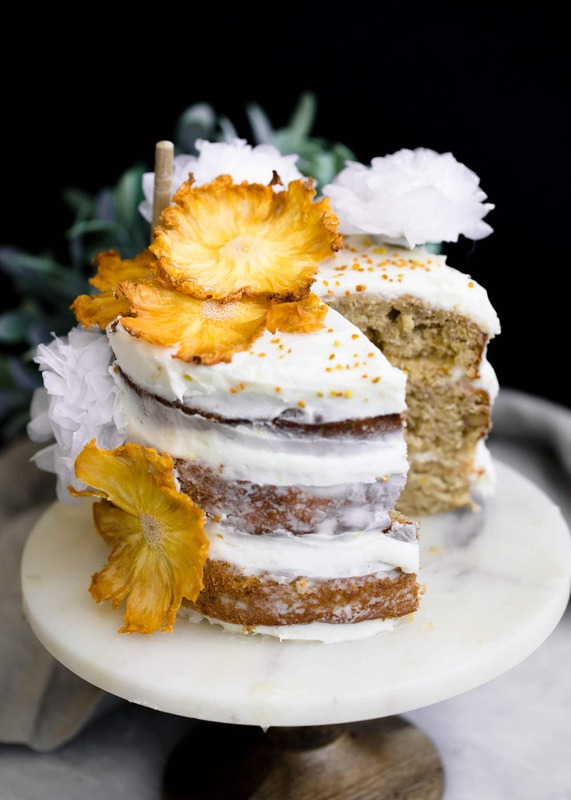 Those pineapple slices tho…stunning cake, sarah. And I have always wondered why Hummingbird cake wasn’t more popular. 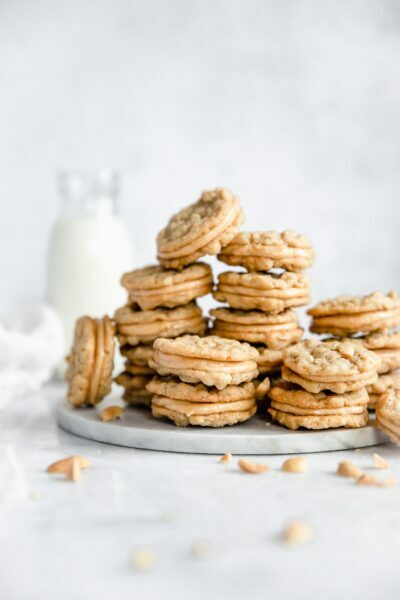 I have a feeling it may make a comeback once people see this recipe! Oh thank you so much Debs! That’s so sweet of you! I can imagine actual hummingbirds flitting around this gorgeous cake, love it! What a beautiful and elegant looking cake! yum! Such a pretty cake! Love the gorgeous pineapple flowers! Oh I just love those pineapple flowers and the bee pollen! What a fantastic idea! I cannot wait to make this cake. I made one years ago myself but I am always on the search for better recipes! Yummy! I didn’t know pineapple slices could turn out so pretty! I 100% thought they were actual flowers. I’ve never heard of a Hummingbird cake before but the flavors do remind me of a lot of desserts from the southern side of my family. Right?! I totally want to make them again! Such a stunning and beautiful cake!! LOVE this! Haha I am so glad your followers are not the type to leave rude messages- I’m always shocked when I scroll down to leave a comment and see hate. Just… why? This cake is gorgeous- love your decoration. Hummingbird cake has so much going on, but is always so delicious! Hummingbird cake is one of my all time favorites. This looks like a beautiful rendition of it! So pretty! 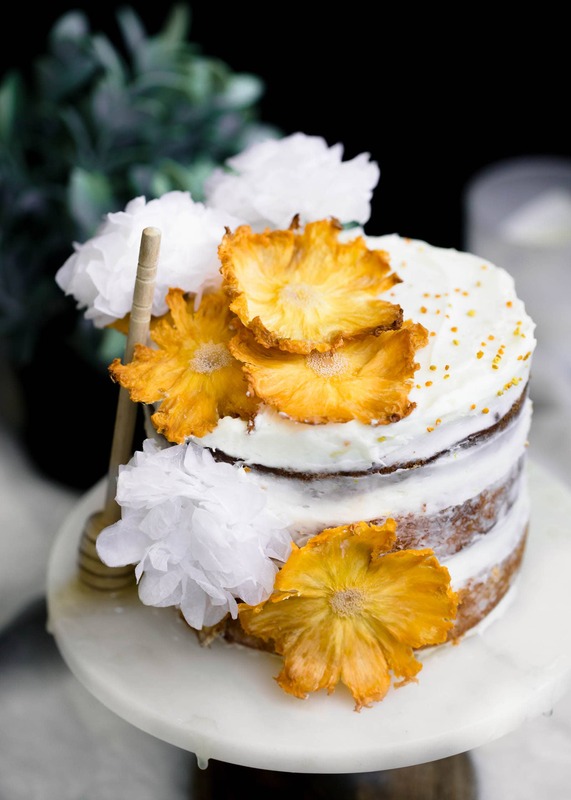 I’m totally in love with those pineapple flowers… now please bring on cake (and Spring break!). This cake is so beautiful!!! And totally LOL on the cannabis comment!! I’m doing the cake for my sister’s bridal shower next week and I love humming bird cakes and naked cakes! I wanted to see how much you would do for 70-80 people though. Im definitely going to need two tiers. Maybe 3 10’s and 3 8’s? Do you think that would be enough? And how much should I add to your recipe for cake and icing? Thanks so much! Hi Sarah! Oh this cake will be just perfect for a bridal shower! I would do exactly as you’ve said- 3 10’s and 3 8’s. Maybe even do 3 6’s on top if you feel like going all out. If you’re doing 3 10’s and 3 8’s I would 4x the recipe. If you’re doing the 6’s on tippity top I would 5x the recipe. And I absolutely recommend getting an acrylic cake stand like this one that will help to anchor the cake because it will be so heavy! Feel free to email me with additional questions! Honestly I’m so afraid of doing too tall of a cake because I have to drive an hour to the destination by myself. Im actually pretty nervous about doing it with two tall tiers haha! I checked out the stand you suggested. Is that what you would use in place of a cake board? Ive never seen those before. My friend suggested doing 3 12’s and 3 9’s for stability. Would you do 5x the recipe for that too? And thank you for such quick replies! Oh wow, that is a feat! So the thing I linked is a common way to do tiered cakes. If you want all your cakes separate (so like 3 10’s next to 3 8’s, etc), do the cake boards. But if you want them stacked on top of each other, do something similar to what I linked (Alternatively, you can buy cake dowels. That’s a great way to stack cakes so you can’t see the acrylic between layers). If you look up some tutorials on YouTube you can see how they hold everything together. Since you’re driving, it may be good to do the cakes separately, then do the dowels, stacking, and final decorating touches once you arrive. If you want to do 3 12’s and 3 9’s, I would 5x the recipe. Hope all this helps! MAking this today for Easter . Instructions say “Grease AND line three 6-inch cake pans…”. Do I really do Both? Thanks! My husband made this cake for my birthday tonight, and it was so good. I agree with previous comments that the cake is sweet enough and moist enough to not need the extra frosting on the sides. We both have major sweet toothes, and both agreed next time we would follow the directions and not frost the sides. This cake would also be very good without frosting, its that sweet and moist on its own. I think I will be making this cake for Easter, as it seems very appropriate for spring. Or maybe make it during a cold snap when we’re wishing for spring! !